It’s always fascinating to see the public responses to columns challenging the notion that man is “causing” the earth to warm. Predictable are the personal attacks against such purveyors of contrarian dogma, as well as references to the favorite buzzwords and invalidated theses. It’s difficult to understand such fierce loyalty and fealty to a theory invalidated by their own models. Whether they’re looking for meaning in life by “saving the world” by diminishing their CO2 footprint, or they’re susceptible to the mainstream media propagandistic endorsement, it’s hard to say. Let’s start with the obvious, which for some is not obvious, nor easily accepted. According to NASA, global temperatures have not increased for 15 years. Here is the chart for actual temperatures as published by NASA clearly illustrating the cessation of warming in 1998. The plot appears dramatic, but notice the scale on the left axis. From 1880 to 2013 the range is .8 of one degree Celsius. We can then look at the chart developed by former UN IPCC Lead Author & Climatologist Dr. John Christy which plots 73 global warming models. 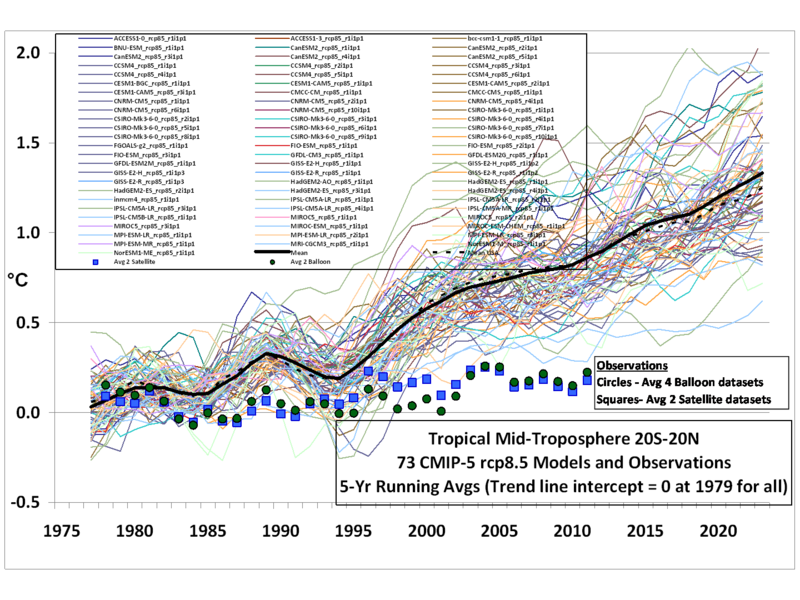 The models’ projections are based on climate sensitivity to manmade carbon dioxide. In other words, the models reflect the premise that man is causing, or at least contributing significantly to, warming of the planet. Yet not one of the models even comes close to reality based on NASA’s empirical data. The mean average for those models is nearly 1 degree Celsius higher than what has been observed for the past 15 years. Why is this significant? Because it shows that, based on their own theories, and their own calculations of climate sensitivity to manmade CO2, that they’re all wrong. If their theories about the greenhouse potency and feedback of carbon dioxide emissions were correct, their model projections would match reality. And it’s not the earth that’s at fault; it’s the models and their underlying theory! When they’re so wrong for so long, how can anyone with a semblance of cognitive functionality even possibly consider taking them seriously! I can’t help but conclude what a phenomenal job it is to be an anthropogenic global warming (AGW) scientist. Come up with these alarmist theories to provide global governments the premise to regulate and tax what we exhale as a pollutant; rake in hundreds of millions from government grants to do so; generate sophisticated models to ring the warning bells of catastrophic manmade global warming; be proven totally wrong empirically, and yet still be heralded by media, academia, environmentalist activists, and low-information citizens, as ultimate authorities on the issue, and claim to be right! With such an abysmal record of projecting reality, now 15 years and running, it would be like a stock analyst in my industry forecasting a decade-and-a-half of bull markets, and be proclaimed a market guru even if all 15 years were bear markets! It’s logically impossible to be right, as claimed by media, academicians, and AGW sycophants, when the alarmist’s calculations, as evidenced by their projections, are completely wrong! “There are two conceivable explanations — and neither is very pleasant for us,” said Storch. “The first possibility is that less global warming is occurring than expected because greenhouse gases, especially CO2, have less of an effect than we have assumed. This wouldn’t mean that there is no man-made greenhouse effect, but simply that our effect on climate events is not as great as we have believed. The other possibility is that, in our simulations, we have underestimated how much the climate fluctuates owing to natural causes,” Storch added. Now that’s an astute statement of the obvious. And notice how he was more concerned that they were all wrong, rather than that the earth was facing cataclysmic warming. So how do most scientists really feel about AGW? According to Forbes, citing peer-reviewed surveys in February, only 36% of geoscientists believe humans are creating a global warming crisis, and a solid majority believe what warming is occurring is from natural sources. 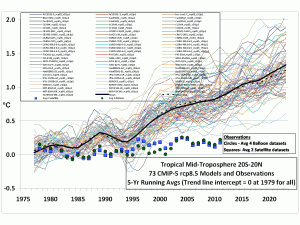 If the AGW argument was correct, their models would be accurate. Since they are not, their basic premises are obviously flawed. And to say there’s a consensus is equally fallacious. AP award winning columnist Richard Larsen is President of Larsen Financial, a brokerage and financial planning firm in Pocatello, Idaho and is a graduate of Idaho State University with degrees in Political Science and History and former member of the Idaho State Journal Editorial Board. He can be reached at rlarsenen@cableone.net.